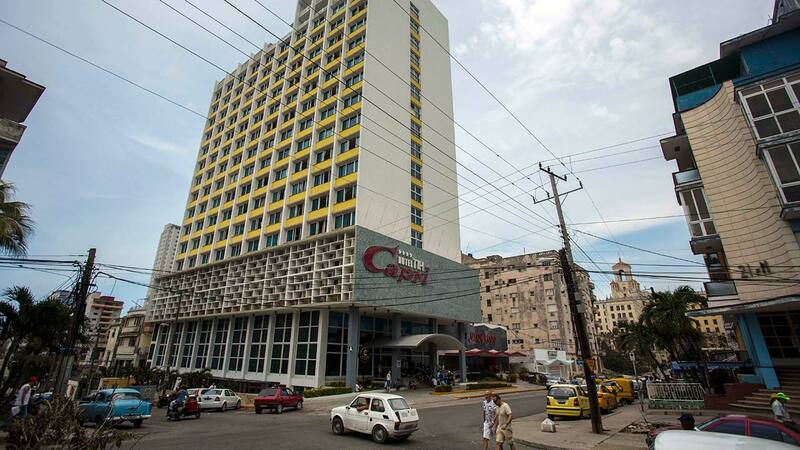 WASHINGTON -- The United States is warning Americans against visiting Cuba and ordering more than half of U.S. personnel to leave the island, senior officials said Friday, in a dramatic response to what they described as "specific attacks" on diplomats. In a new travel warning to be issued Friday, the U.S. will say some of the attacks have occurred in Cuban hotels, and that while American tourists aren't known to have been hurt, they could be exposed if they travel to Cuba. Tourism is a critical component of Cuba's economy that has grown in recent years as the U.S. relaxed restrictions. For now, the United States is not ordering any Cuban diplomats to leave Washington, another move that the administration had considered, officials said. Several U.S. lawmakers have called on the administration to expel all Cuban diplomats. In May, Washington asked two to leave, but emphasized it was to protest Havana's failure to protect diplomats on its soil, not an accusation of blame. Almost a year after diplomats began describing unexplained health problems, U.S investigators still don't know what or who is behind the attacks, which have harmed at least 21 diplomats and their families, some with injuries as serious as traumatic brain injury and permanent hearing loss. Although the State Department has called them "incidents" and generally avoided deeming them attacks, officials said Friday the U.S. now has determined there were "specific attacks" on American personnel in Cuba. Secretary of State Rex Tillerson made the decision to draw down the embassy overnight while traveling to China, officials said, after considering other options that included a full embassy shutdown. President Donald Trump reviewed the options with Tillerson in a meeting earlier in the week. The officials demanded anonymity because the moves have yet to be announced. The United States notified Cuba of the moves early Friday via its embassy in Washington. Cuba's embassy had no immediate comment. The moves deliver a significant setback to the delicate reconciliation between the U.S. and Cuba, two countries that endured a half-century estrangement despite their locations only 90 miles apart. In 2015, President Barack Obama and Cuban President Raul Castro restored diplomatic ties. Embassies re-opened, and travel and commerce restrictions were eased. Trump has reversed some changes, but has broadly left the rapprochement in place. The Trump administration has pointedly not blamed Cuba for perpetrating the attacks. Officials involved in the deliberations said the administration had weighed the best way to minimize potential risk for Americans in Havana without unnecessarily harming relations between the countries. Rather than describe it as punitive, the administration will emphasize Cuba's responsibility to keep diplomats on its soil safe. To investigators' dismay, the symptoms in the attacks vary widely from person to person. In addition to hearing loss and concussions, some experienced nausea, headaches and ear-ringing, and the AP has reported some now suffer from problems with concentration and common word recall. Though officials initially suspected some futuristic "sonic attack," the picture has grown muddier. The FBI and other agencies that searched homes and hotels where incidents occurred found no devices. And clues about the circumstances of the incidents seem to make any explanation scientifically implausible. Some U.S. diplomats reported hearing various loud noises or feeling vibrations when the incidents occurred, but others heard and felt nothing yet reported symptoms later. In some cases, the effects were narrowly confined, with victims able to walk "in" and "out" of blaring noises audible in only certain rooms or parts of rooms, the AP has reported. Already, staffing at the embassy in Havana was at lower-than-usual levels due to recent hurricanes that have whipped through Cuba. In early September, the State Department issued an "authorized departure," allowing embassy employees and relatives who wanted to leave voluntarily to depart ahead of Hurricane Irma. Though Cuba implored the United States not to react hastily, it appeared that last-minute lobbying by Castro's diplomats was unsuccessful. The days leading up to the decision involved a frantic bout of diplomacy that brought about the highest-level diplomatic contacts between the countries since the start of Trump's administration in January. Last week, the Cuban official who has been the public face of the diplomatic opening with the U.S., Josefina Vidal, came to the State Department for a meeting with American officials in which the U.S. pressed its concerns. Foreign Minister Bruno Rodriguez used his speech to the U.N. General Assembly to insist Cuba had no idea what was harming American diplomats, while discouraging Trump from letting the matter become "politicized." Citing its own investigation, Cuba's embassy said after the meeting: "There is no evidence so far of the cause or the origin of the health disorders reported by the U.S. diplomats."